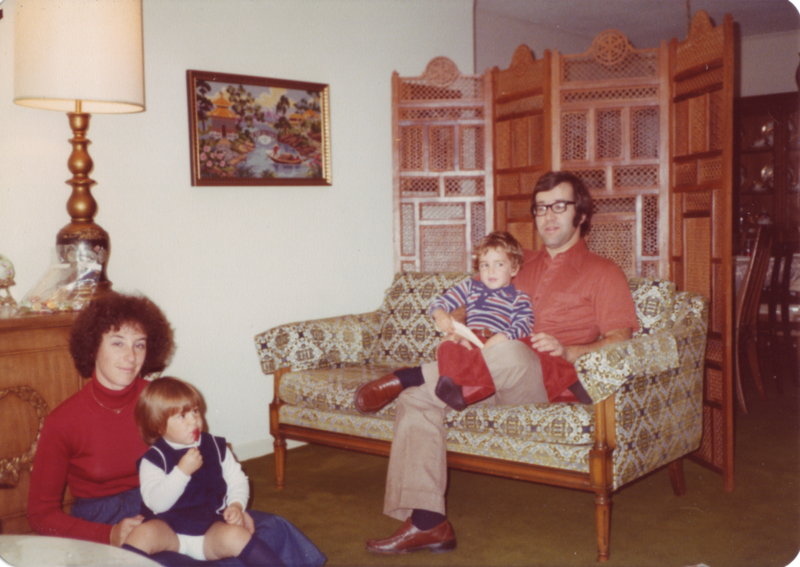 The picture below was taken in Louis and Essie’s home at 6600 Cavendish apartment 1204, likely in the late 1970s. I’m sitting on my uncle Elliot’s lap and Alicia is sitting on my mom’s lap. Besides the funky looking lamp and picture on the wall, all the furniture you see here is still in use (as of January 2015). The dining room set, including china cabinet, table and buffet (not seen from this angle) are in my house along with the screen behind the couch. Essie and Louie bought this screen on a trip to Mexico. I’m not sure how they managed to get it back to Montreal. The couch is in Alicia’s house but it is now a turquoise type of blue, having been thankfully recovered by Essie in the mid 1980s. The cabinet behind my mom is now located at their country house. This really is an example of reduce, reuse and recycle! I remember that cabinet was a storehouse of memorabilia. One thing I wish I had kept were some old newspapers including the last Montreal Star which was published on September 25, 1979.